• 13,000 physical servers across 9 sites. • The remaining DC’s are rented from BT, Verizon and NTT (contracts end Q1 2015) . The CFO has voiced his desire to cut the cost of these rentals and would ideally like to not have to renew the contracts if possible. • With the exception of ERP, all systems must move to a shared or distributed model. This is following a series of natural disasters in the US and China, that could have been avoided by having a DR and BC plan in place. • All communication end points are encrypted, but new legislation is relaxing where encryption is required. This is achievable following an ERP upgrade that separates out sensitive and non-sensitive data. So that is the company profile and my idea around it. I obviously created 90% of the above from my head so there will be additional questions around it but I think this gives a really solid amount of information for people to start thinking. I’m going to do the first posting around Storage Design for Safe and Legit quite soon and will put up what questions and component you normally have to think of but if people want to think of what they would choose prior then hopefully we can get a good discussion going around it. Categories: Certifications, VCAP, VCDX, Virtualisation | Tags: design, VCAP, VCAP-DCD, VCAP5-DCD, VCDX, VMware, vSphere Design, Xtravirt | Permalink. I first started using VMware back in the GSX days when researching a way to save data center space for a global supplier to energy products I worked for. I remember hearing about this “vMotion” thing which pushed me to look into ESX. I built a small environment, staged the scenario, issued the vMotion command, and was hooked. I will never forget that moment and what followed by relaying the good news to our CIO. He promptly challenged me on what I just described to him. The demo date was set, I again built the scenario, and in a small conference room showed our CIO the power of vMotion. He just smiled and said “Continue forward and get this stuff in our data center!”. I haven’t stopped with VMware since that day and that was over eight years ago. It’s been an amazing adventure seeing VMware grow and watching the changes and impact it has made to all our lives and how we work. I was challenged by an old boss to go after it a couple of years ago back when it was in its infancy. I began reading up on what all was required, the process, and reading others blog about their experience of the journey. Saying I was intimidated is an underestimate but the funny thing was I was inspired and challenged all at the same time. Take their time! It’s not a race to get the certification. Learn all you can about every aspect of an entire solution. 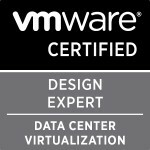 Where the certification is obviously centered around VMware, it will challenge you on every aspect of a design and a total solution (Networking, Storage, Compute, Business impact, etc) and how each and every one of those relate to VMware and the end design. I found I was questioned on things I never thought of during my preparation and honestly, sometimes things I didn’t know. The panel isn’t there to make you look dumb or prove that they are smarter than you. They will help you through it as much as they can, so as much as it’s about challenging you on what you know, it’s also about your thought process and how you approach a problem and work through it. I work for a pretty amazing company! Throughout the entire process they embraced my journey, encouraged me along the way, and in the end were extremely proud when I shared the good news. They wrote this blog article to celebrate the news which I was honored to have done. I get the “Was it worth it” question a lot. Mostly from customers who have heard of the certification and want to know about it and my journey but also from others in the community. I always respond ABSOLUTELY! I learned an immense amount about designing solutions and myself as an individual. In addition and probably most important, I became a better Architect, Engineer, and Consultant. The people I met and interacted with throughout the entire process has been amazing… Many of those who I know will be a part of my career for a very long time! Categories: Certifications, VCDX, Virtualisation | Tags: VCAP, VCAP-DCA, VCAP-DCD, VCDX, VCDX5, Virtualisation, virtualization, VMware | Permalink.